In writing this text I have attempted to deal with each perspective on landscape in as objective and as even-handed a manner as possible. Even so, it would be dishonest for me to claim an equal level of interest in all the approaches discussed. My background is in landscape history and landscape archaeology, and there can be little doubt that had I developed a career in, say, cultural studies or art history a different book would have resulted. Landscape provides a source of fascination for enthusiasts from many different disciplinary and social backgrounds. Here we have been concerned with the intellectual exploration of landscape rather than with applied work such as that associated with planning, landscape gardening or landscape design. 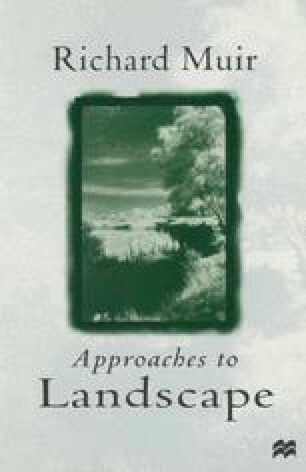 It has been demonstrated that a spectrum of different approaches has been adopted by writers and researchers engaged in this intellectual exploration, each one reflecting a different perspective on the subject matter of landscape.